Republican presidential hopeful Fred Thompson acknowledged Wednesday that he's reversed his position on ethanol subsidies, saying his new stand is based on changes in energy prices and security issues. Thompson spoke about the issue after touring an ethanol plant, one of dozens in Iowa, which leads the nation in ethanol production. The actor and former Tennessee senator was finishing a five-day trip to the state, where precinct caucuses begin the presidential nominating process. Meeting with reporters, Thompson acknowledged that he had switched his position on subsidies for ethanol. "I have voted against subsidies in the Senate," said Thompson. "But I think it's a matter now of national security and we've got to avail ourselves of a lot of different resources, and I think renewable has to be a part of that picture." Carrie Giddins, communications director for the Iowa Democratic Party, was quick to point out that Thompson opposed such subsidies as a senator. "Iowans deserve to know why Thompson tried to kill the ethanol industry while in the United States Senate," she said. Thompson noted the difference in oil prices today compared to when he was a senator from 1994 to 2002. "When I was in the Senate, I think oil was at $23 a barrel," said Thompson. Oil now is about $80 a barrel. It has become a staple on the campaign trail for presidential candidates to tour ethanol plants, such as the Nevada facility that produces 50 million gallons of ethanol a year. The plant employs 43 people and processes 50,000 bushels of corn a day, a demand that has helped increase the prices for the crop. Thompson said turbulence in oil-producing regions of the world have added urgency to the push for energy independence. 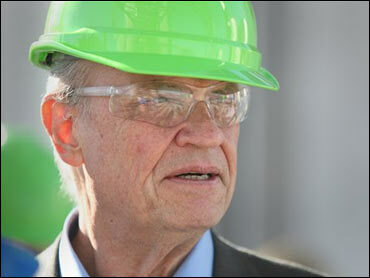 "Our need to move toward energy independence has become absolute," said Thompson. "So much of our energy depends on troubled spots in the world. It's just a different environment."